This collection of artwork was created by Barbara S. Learn over the decades of her studies at Pratt Institute in NYC, to summer workshops at Cape Cod, and her life as an artist, wife, and mother in Western New York. The pieces represented in this exhibit have been culled from the family's storage library of sketches, studies, watercolors, and oils. Many have never been displayed before and have been cleaned and presented for exhibit for your appreciation and enjoyment. Purchase and handling information is available at the Exhibit. Barbara studied art at the Pratt Institute in New York City. This accomplishment far exceeded the expectations of the young women in the 1930s from a small American town. She was an apprentice under the tutelage of Robert Noel Blair, a prolific Western New York Artist. She also painted with the North Truro, MA Art Association and the Olean, NY Art Association among others. 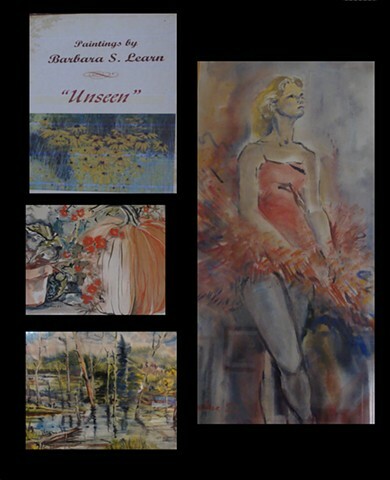 Barbara's work was shown at the prestigious Albright Knox Art Gallery and Lakeview Gallery in Buffalo, NY. She received many awards for her artistic talent. Barabar worked in a variety of media including oil and pen & ink but she is known for her vibrant, fluid, natural landscapes in watercolor. Her watercolors were full of wash with seemingly effortless brush strokes. Free and Open to the public, this collection will be on display at the studio from August 2017 during open studio hours.